The interconnectivity and interdependence of the global economy was dramatically demonstrated in late 2008 when failings in the British and US housing markets triggered a financial crisis that spread around the world and plunged many countries, including Britain, into a recession, form which we are only just beginning to emerge. But how have rural regions fared in the recession? And might globalization help or hinder recovery? Yesterday, Jesse Heley and I explored these questions in a presentation on ‘The Recession and Rural Wales’ in Cardiff as part of WISERD‘s ‘Wales and the Recession Seminar Series‘. The answers, we showed, are not straightforward. The broad trend seems to be that the recession hit rural Wales more slowly and less severely than it did urban areas, but that the recovery has also been slower. The number of unemployed people, for example, increased by 60% in urban parts of Wales between 2007-8 and 2012-13, but by 35% in rural Wales; with the number of Jobseekers’ Allowance claimants in rural Wales peaked in 2009 and has since largely plateaued, whilst in urban Wales it continued to rise. Yet, there are big differences in the trends between different parts of rural Wales. Pembrokeshire, for example, which includes the port of Milford Haven, saw a sharp increase in unemployment between 2008 and 2009, which has only fallen back slightly. 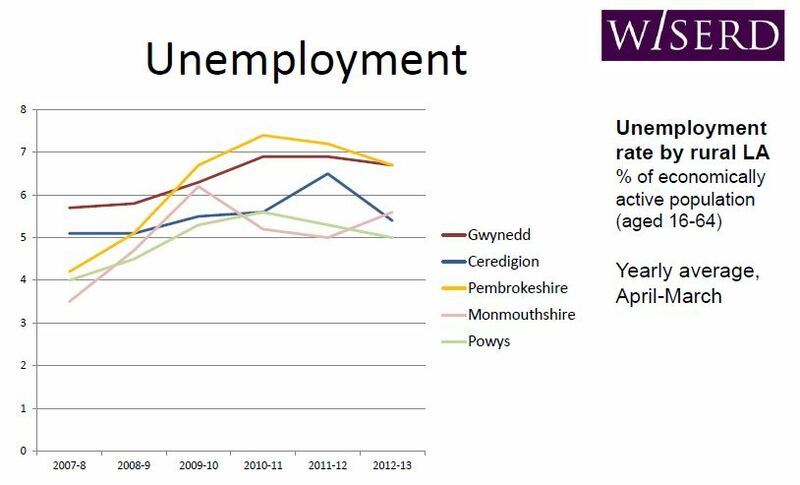 In contrast, unemployment in Monmouthshire peaked early in 2009-10 and has decreased notably since; whilst in Ceredigion, with a large public sector workforce, unemployment increased more gradually and peaked later in 2011-12. 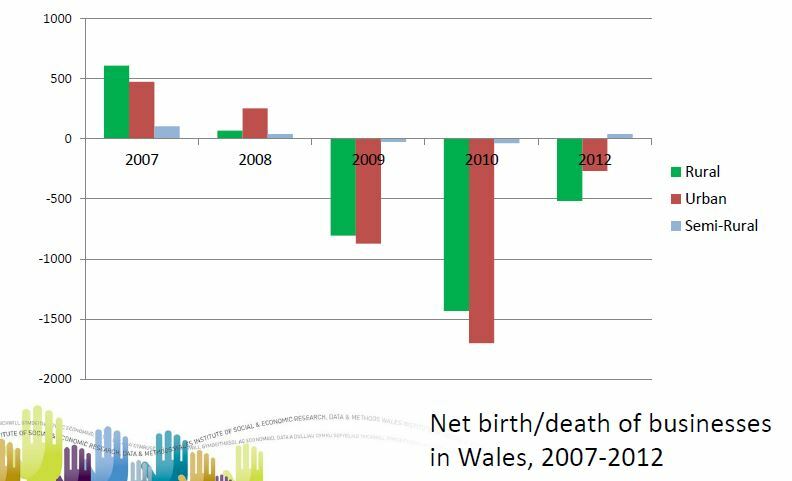 The total number of businesses operating decreased in both rural and urban parts of Wales from 2008, at fairly similar rates, but analysis of statistics for new business starts (‘births’) and the failure of businesses (‘deaths’) reveals a more complex picture. Before the recession in 2007 the rate of business growth in rural Wales was exceeding that in urban areas, and during the depth of recession slightly fewer businesses were lost in rural areas than in urban Wales. Yet, the latest available statistics for 2012 suggest that recovery is slower in rural areas, with the net loss of businesses exceeding that for urban districts. However, even if statistics suggest that the overall impact of the recession has been less severe in rural parts of Wales, it has still created real difficulties for many rural households, as data from the periodic survey of 4,000 households in rural Wales conduced by the Wales Rural Observatory records. The number of households reporting that the claimed benefits such as Housing Benefit, Council Tax Benefit or Winter Fuel Payments increased substantially between 2007 and 2013, for instance, and when asked in 2013, nearly half of respondents said that they thought income levels in their local area had worsened in recent years (although household income reported by respondents shows remarkably little change over four surveys from 2004 to 2013). Around a fifth of respondents in 2013 confided that they were finding it difficult to manage on their present income, and there is evidence that many households have been drawing on savings to make ends meet: the number of households reporting that they had less than £1,000 in savings increased from 33% in 2010 to 44% in 2013. Similarly, the Wales Rural Observatory’s survey of 2,000 businesses in rural Wales reveals the pressure of the recession. Whereas in 2007, 58% of businesses reported that their turnover had increased in recent years, by 2013 that figure had fallen to 27%, with 39% reporting that their turnover had decreased. Indeed, the proportion of businesses reporting annual turnover of less than £60,000 increased from 22% in 2007 to 30% in 2013; and businesses reporting that they had made a loss or only broken even in the previous year increasing from 15% to 19% over the same period. The patterns suggested by these headline statistics are reinforced by interviews that Jesse conducted with business owners and managers in mid Wales as part of WISERD research in 2009 and repeated in last few weeks. Back in 2009, some interviewees had shown trepidation about the recession, but some had been bullish, one claiming that: “We don’t get the highs and lows [in rural Wales]; the business stays on a much more even keel”. By 2014, several of Jesse’s original interviews were no longer in the same jobs – including the manager who made this claim – having been made redundant, or seen their business fold. Those who are still here reflected on the recession with mixed experiences. Some had found that business had held up better than they had expected; others had struggled. Many agreed that the pinch for them only really came in 2012, much later than the national trend. So, how might we explain these diverse observations? There are, we think, several factors at work that relate particularly to rural Wales (or parts of it). Firstly, the economy of rural Wales is dominated by small and medium sized enterprises (SMEs). This means that there were no mass redundancies as large factories closed or downsized to create spikes in unemployment, but instead there has been gradual attrition as SMEs have borne the brunt of the downturn. By 2011 there were 2,340 fewer businesses in rural Wales that employed less than 20 people than in 2008, but only 20 fewer firms that employed more than 20 people. Secondly, some parts of rural Wales are heavily reliant on the public sector (Ceredigion, for instance, has one of the highest levels of public sector employment in the UK at 36% of the workforce). This provided a cushion in the early days of the recession, as public sector jobs were more secure than private sector jobs. However, as public spending cuts have started to take affect, redundancies, job freezes and pay restraint have hit. Thirdly, agriculture too has worked to its own cycle. Data from the Farm Business Survey collated by colleagues in IBERS here at Aberystwyth University show a drop in both average farm income and profits in 2012-13, but until then the trend over the previous decade had been of steady improvement. Welsh agriculture is hardly prospering at present, but it is doing better than during the Foot and Mouth Disease crisis in 2001 or in the late 1990s when farm-gate prices plummeted. The rise in global food prices is partly responsible for this. Fourthly, there are certain costs associated with a rural location that have dampened the recovery: both households and businesses have suffered from rising fuel prices, for instance, as incomes have fallen or remained static. Finally, what about globalization? Global connections can create vulnerabilities – some businesses in rural Wales have been hit by the loss of export markets or breaks in supply chains – but previous research elsewhere in Europe for the DERREG project intriguingly suggests that global business networks can help firms be more resilient by spreading risks. Indeed, the DERREG research found examples of businesses expanding exports as a response to contracted domestic markets, and there are some signs of this happening in Wales: the proportion of rural business responding to the WRO Business Survey with customers overseas increased from 20% in 2010 to 26% in 2013. Moreover, using migrant labour might also reinforce resilience, as migrant workers are often the first to be let go in difficult times, providing something of a buffer for the endogenous workforce, and will commonly move away from the locality if alternative work cannot be found (indeed, migration more generally is a strategy for coping with recession in rural areas as younger people in particularly tend to move away to try to find work rather than remaining and contributing to local unemployment figures). Again, research by the Wales Rural Observatory on migrant workers in Wales shows that the total number of Eastern European migrant workers in rural Wales had decreased between 2007 and 2013, and that finding appropriate work had become more difficult. These two aspects – the export activities of rural businesses and the dynamics of international labor migration in rural areas – are issues that we propose to investigate further in GLOBAL-RURAL, both in Wales and in Ireland.